Richmond Oaks is a breath of fresh air for city dwellers in search of scenic landscape and country calm. The community features a variety of single-family homes and bungalows, each built on some of the largest lots available and personalized to our homeowner's specifications. This is your LAST OPPORTUNITY to live in this great community. 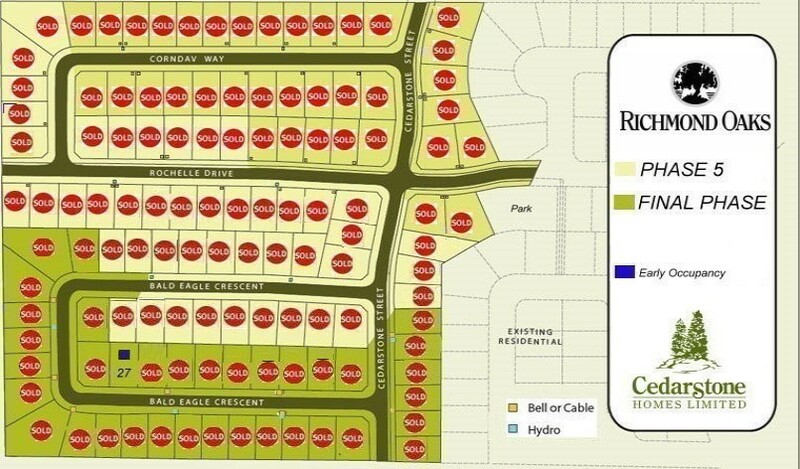 These are the largest lots available in Richmond . You will not see lots this size again. ACT NOW! As both the developer and builder of Richmond Oaks, Cedarstone Homes is proud to contribute to the area's growth. When we complete our final phase , we will have provided approximately 200 new homes to Richmond residents. We hope you will be among them. This is your last chance to own in this community. Led by owner Kim Pijselman and his long-standing team of professionals, we build extensively in the area because we appreciate its prime location and natural beauty, and are committed to helping enrich the village. Our customized homes fit in perfectly with the community, and always meet the individual needs of each homeowner. From classic to contemporary, we are proud to bring our expertise, craftsmanship and unique hands-on service to every home we build. Open Weekends from noon to 5 or by appointment anytime. © Cedarstone Homes 2018 All rights reserved. Website designed by TRUEdotDESIGN.